Home Cleaning & Housekeeping Western Australia Perth Region Perth Inner City Perth CBD Dog Drool - Why Worry? Dog Drool - Why Worry? We often see dog drool on glass, and, frankly, it's not a pretty sight! It is loaded with bacteria, not great when you have kids around, and, looks about as bad as it gets! Is it something that should concern you? Absolutely!! Whilst dog drool really does look bad, it is true that, compared to cats, a dog's saliva is not as bad. However, dogs do tend to chew on some really bad things. So, even if a dog doesn't inherently pose a massive danger to you or the children, it can still be dangerous if the dog has had it's chops wrapped around something bad, hence the advice that we should assume that the dog DOES have dangerous bacteria. Dog Drool - What Connection Does It Have With Your Windows? As professional Perth window cleaners, we see houses, offices and shops that have every kind of family, pets and traffic. One of the least favorite things is to see a home which has not been kept free from the down side of having a dog. For instance, homes sometimes have a terrible dog odor. It's not that the owners just ignore it, most times they have adjusted to the smell and probably are not aware of just how bad a home with dogs can smell. We can't blame the dog for slobbering on the windows, it is natural for them to press up against them. However, what pet owners, especially those who have children, need to do is to keep the windows clean and free of dog saliva. Doing this regularly will reduce the risk of unhealthy effects and will keep your home looking fab! With that in mind, how can you get the right solution to remove the drool? Since one of our main concerns is our family, we should try to use a cleaning solution that is lower in chemicals and artificial ingredients. Therefore, what we recommend is trying a homemade recipe. 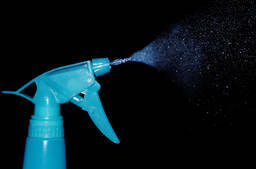 What we do recommend after this, is to follow up with a windex or similar spray. There are some less artificial recipes that companies bring out which should keep the job fairly natural. But, you might wonder, why use windex after you have already done the job with your vinegar solution? Basically, getting a high shine spray, and using just a little of it with a lint free cloth will finish off the job and add the finishing shine to the glass. Since it will be just a touch up, you shouldn't require much of the windex.